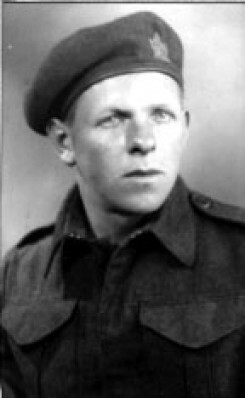 Clifford John McDonald received his training in Woodstock, Ontario in 1940. Private McDonald enlisted January 20, 1943. He was granted permission to marry Marjory Gowan in Toronto on July 20, 1943. Private McDonald served in England, Germany, Dieppe, Italy and in Holland. For his services he received the 1939-45 Battle of Britain Star, Italy Star, France and Germany Star, Canadian Volunteer Service Medal and the War medal 1939-1945. Following the war, Marge and John McDonald purchased the farm at Lot 13 Concession 3 where they raised their 11 children.